Lutaris come directly from the mysterious shores of Lutari Island and once you have one, you will be pleased to know that your Lutari can be painted in many different colors: Baby, Brown, Chocolate, Desert, Disco, Eventide, Faerie, Fire, Ghost, Island, Magma, Maractite, Pink, Pirate, Rainbow, White, and Zombie with undoubtedly new colors to come out this Lutari Day. Once you have your Lutari, they'll be your pet to take care of for life. After all, they absolutely refuse to be transferred or sent to the Neopian Pound and will run away if you try to do either, and you wouldn't want your Lutari living all alone out in the wilderness of Neopia. Now that you have such a special and coveted Neopet, you might be wondering "how in the world am I going to be able to dress my Lutari?" Never fear, Lutari owners and customizers, for there are a number of fashionable outfits that are Lutari specific and range across different styles for every Lutari personality type and color. 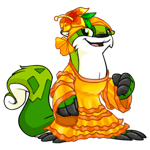 Just in time for spring, the Fancy Orange Lutari set is perfectly in style for the season! This outfit consists of a bright and vibrant orange dress and an orange head wrap with a very decorative spring flower on the top. Best of all, it's very affordable. The set consists of only two pieces and you can buy the Fancy Orange Lutari Dress for 10,000 neopoints and the Fancy Orange Lutari Hat for 6,000 neopoints. Your Lutari will demand attention in this fashion forward outfit and will definitely be setting high standards for Neopian spring fashion! Total Approximate Outfit Cost: 16,000 neopoints. While the Futuristic Lutari Diving set might not say "spring", it does say COMPLETELY AWESOME. What does a Lutari enjoy more than swimming? Absolutely nothing. 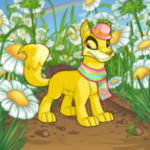 Now your Lutari can demand all of the attention down by the water and look like a character right out of their favorite science fiction comic while doing so. This outfit consists of six different parts: Futuristic Lutari Diving Boots (3,000 neopoints), Futuristic Lutari Diving Gloves (3,000 neopoints), Futuristic Lutari Diving Helmet (97,000 neopoints), Futuristic Lutari Diving Pack (3,500 neopoints), Futuristic Lutari Diving Shirt (18,000 neopoints), and a pair of Futuristic Lutari Diving Shorts (5,000 neopoints). They will be the envy of all of their swimming friends with this extremely high-tech and cool looking outfit set. And don't worry, the material of the outfit will not weigh them down in the water. Lutaris are expert swimmers, after all. Total Approximate Outfit Cost: 129,500 neopoints. Ah yes, the Lutari Aristocrat Outfit set! A set for our fancier gentlemen. This outfit consists of several parts: a Lutari Aristocrat Cane (55,000 neopoints), Lutari Aristocrat Jacket (82,000 neopoints), Lutari Aristocrat Shoes (Unbuyable - Exact Price Undetermined), and a Lutari Aristocrat Wig (80,000 neopoints). 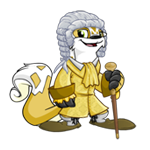 This is a fairly expensive outfit, but rest assured that your Lutari will feel like a very classy and sophisticated sir when they stroll out into public and you too will be able to feel classy by association. 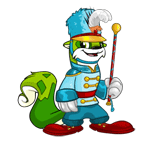 You could even buy your Lutari a wearable Smarmy Monocle to complete the indubious look. Total Approximate Outfit Cost: 217,000 neopoints (without the unknown cost of the shoes). The Smarmy Monocle is not a part of the outfit set but if you wanted to buy it, it is 12,000 neopoints. The description of this outfit is "Ready to be cute, captain!" and ready to be cute your Lutari will most definitely be in this outfit set. 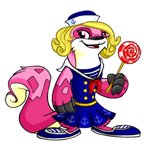 You can buy this outfit in four different parts: the Lutari Sweet Little Sailor Dress (90,000 neopoints), Lutari Sweet Little Sailor Wig (30,000 neopoints), Lutari Sweet Little Sailor Lolly (28,500 neopoints), and a pair of Lutari Sweet Little Sailor Shoes (9,000 neopoints). With the warm weather quickly approaching, your Lutari will probably venture out on several boat trips, and what better way to be prepared for the sea than looking this adorable and sweet? Total Approximate Outfit Cost: 157,500 neopoints. This is a very elegant and classy looking three part outfit for the Lutari, featuring different shades of purple. Much like our Aristocrat Lutari outfit for the gentlemen, this outfit promises to make your Lutari look like a very proper and classy young woman and looking incredibly beautiful while doing so. The three parts of this outfit consist of the Pretty Purple Lutari Dress (68,000 neopoints), Purple Lutari Cloche (11,000 neopoints), and a pair of Purple Lutari Shoes (9,000 neopoints). Total Approximate Outfit Cost: 78,000 neopoints. It is no question that a Lutari is by spirit very adventurous and perhaps yours would like to take to the sky one day? 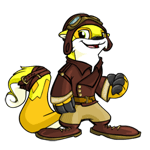 There is no better way to prepare your Lutari for a sky adventure than by buying them the proper outfit, and this Aviator set is also incredibly stylish, so it can be worn at any time of the year! 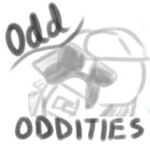 (Though it might be a bit too warm in the summer months.) You can buy this outfit in five parts, consisting of the Lutari Aviator Jacket (99,000 neopoints), Lutari Aviator Trousers (25,000 neopoints), Lutari Aviator Cap (15,000 neopoints), Lutari Aviator Tail Belt (26,000 neopoints), and a Lutari Aviator Belt (28,000 neopoints) to keep those trousers up when your Lutari is busy flying throughout the sky! Total Approximate Outfit Cost: 193,000 neopoints. Now your Lutari can have fun both on the job and in the Neohome! With this full get-up they'll be serving in style and not only that, they'll be whizzing around in those rollerskates as often as physically possible and the dress and wig pull the outfit together to make your Lutari even more adorable than they already are. You can buy these dazzling get-up in four parts: the Lutari Rollerskate Waitress Dress (99,000 neopoints), Lutari Rollerskate Waitress Wig (83,000 neopoints), Lutari Rollerskate Waitress Skates (31,000 neopoints), and a Lutari Rollerskate Waitress Tray (99,000 neopoints). Total Approximate Outfit Cost: 312,000 neopoints. Last but not least, we have the very fun and cute Lutari Band Leader Outfit! If your Lutari is musically inclined and enjoys starting music and singing throughout the Neohome and has tried to start a band with your other Neopets, then this is probably the perfect outfit for them. You can buy the band leader outfit in five different parts: the Lutari Band Leader Jacket (300,000 neopoints), Lutari Band Leader Hat (15,000 neopoints), Lutari Band Leader Trousers and Shoes (11,000 neopoints), Lutari Band Leader Gloves (7,000 neopoints), and of course their own Lutari Band Leader Baton (2,000 neopoints) so that they can command the band. Total Approximate Outfit Cost: 335,000 neopoints. "I believe Jhudora alone knows where they are," Fyora told her.